Now Gmail is pretty quick, but turning on Gmail’s keyboard shortcuts (and remembering at least some of them) makes handling email even quicker. There’s one niggle though and it was driving me particularly bonkers. 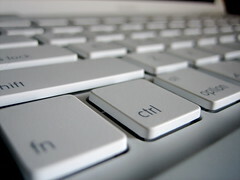 The keyboard shortcut for deleting a message is #. Fine, you’d think. Unless you have an Apple MacBook with a UK keyboard layout. In this case, to generate a # key, you press Alt + 3. Which doesn’t work. Apparently the problem also affects other European keyboard layouts. Now, I can imagine you’re thinking that this is pedantry in the extreme. Surely, it’s not a big deal. Perhaps, but for me, a typical day will see 2-400 emails pour into my inbox. Thankfully, after lots of hunting round, I found a solution, which I’ve written up below in case anyone else is being driven nuts (yes, I know, I need to get out more). Firstly, turn on the Keyboard Shortcuts. Seriously, it’s worth doing this step without anything else. Mastering these shortcuts will save you heaps of time and make the Gmail experience even better. Go to your Gmail settings (top-left hand corner, once you’ve logged in). Click on the link labelled Settings. Make sure Keyboard shortcuts on (see pic below) is selected and click Save Changes at the bottom of the page. Check out the full list in the Gmail help section and there’s a handy printable version put together by Evan Williams of Twitter fame. So, the annoying UK keyboard layout problem? How to get round it? Luckily there’s a feature in Gmail Labs – a collection of handy tweaks for Gmail – called Custom keyboard shortcuts written by the enigmatic sounding Alan S.
Click on the Labs link in your Gmail Settings (see pic below), find the Custom keyboard shortcuts feature and select Enable, then click Save Changes at the bottom of the page. Once the page re-loads, you’ll see a new tab at the top of Settings page, labelled Keyboard Shortcuts, click on the link to tailor the keyboard shortcuts, including that annoying delete key. I’ve left the other settings as their defaults and changed the delete key to 3 (instead of Alt + 3), not particularly imaginative. I figured that the usability people at Gmail have probably given some thought to the layout of the shortcuts and this is almost the same as the default layout. And there you have it, hope that’s useful. I occasionally use a MacBook but mostly use a standard keyboard on a non-Apple desktop. It appears that since your post, our aloof friend Alan S., has introduced an alternative key option to his wonderful feature. So, rather than remap the ‘send to bin’ action, I was able to assign an additional key for this action. I chose the backslash as this is in the same place on my Mac keyboard as the hash is on the other keyboard. Very useful. Thank you for confirming that I’m not simply failing to properly use a keyboard, and for telling me how to fix it. Thanks. This has been driving me a tiny bit crazy since changing my macbook a while ago. Works like a champ! Marvellous, glad it’s come in handy.